In General: It is a good idea to have your pet’s permit with you at all times. Have a reliable collar with your pet’s name, local address, or boat name and updated contact information attached. It is advised to have your pet on a leash at all times and be mindful of interactions with other dogs. Some of the island dogs are strays or aggressive guard dogs. And make sure to pick up after your pet’s waste. Make sure to have some biodegradable doggie waste bags on you. Disaster + Hurricane Preparedness: Pet parents need to take a few simple measures to prepare for disasters and living in the Caribbean makes it imperative to be ready if a hurricane hits. Any situation that is dangerous for you is also dangerous for your animals. It is important to discuss the evacuation and kenneling procedures with your island’s shelter. You will want to investigate if for any reason you must leave your pets behind, if emergency rescue is available. Be prepared for no electricity, phone services, or even airport service for at least 72 hours to a week or more depending on the storm’s severity. Emergency services and police response may be severely limited. In advance, create a disaster preparedness kit for your animals. As part of disaster training, dogs should respond to basic commands, cats and small animals should be comfortable and used to traveling in pet carriers. Make sure to keep your pet’s vaccinations current and keep updated tags on your pet. It is highly advisable to microchip your pet and many countries require a pet be microchipped. Also, keep a list of local accommodations that accept pets in case of emergency evacuation. You will also want to stock up on pet food and extra water or medication for your pet before disaster strikes. Poisonous Bugs / Snakes / Spiders: Mosquitos are very problematic and are known to carry Malayria. You will want to make sure that you take preventative measures for ensuring the safety of both you and your dog against these insects. The parasitic Schistosomiasis, or blood fluke, has been known to embed itself in those swimming in the fresh waters of Antigua, Puerto Rico, the Dominican Republic, Martinique, Montserrat, Guadeloupe and Saint Lucia. Unfortunately, the only way to prevent contact is to avoid swimming in fresh water pools on these islands. 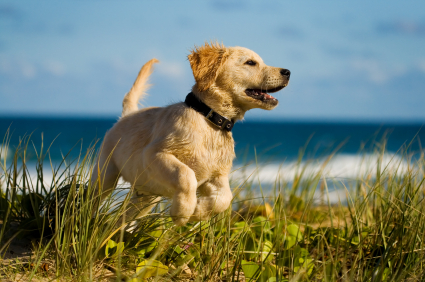 Your safest bet may be to stick to the ocean with your dog. There is also a risk of contracting rabies from bats or wild dogs in Puerto Rico, Trinidad and Tobago, Haiti, Granada, Cuba and Dominican Republic so that is why it is so important to stay current on your pet’s rabies and other vaccinations. As a precautionary measure it is best to avoid petting stray dogs or allowing your pet to interact with the wild dogs roaming many of the islands. Other insects such as millipedes and centipedes can be problematic, and it is important to watch out for the Poison Dart Frog, Brown Recluse Spider, and lethal Banana Spider. St. Lucia, Martinque, Guadaloupe, and Trinidad are the reportedly the only islands to have snakes. The most common snake variation is the Fer-de-lance Snake. Screwworm: Screwworm (fly), a parasitic fly known for its screw-shaped larvae, which infest open wounds. The screwworm is a serious pest of livestock and certain domestic and wild animals. It is found in subtropical and tropical climates from the extreme southern United States to Argentina. Medication Availability on the Islands: Make sure to plan out your pet’s medical cabinet in advance. Not all medications may be available on the Islands or may be restricted for importation and overseas shipping. There may also be quite a price difference for the medication from the mainland to each island. 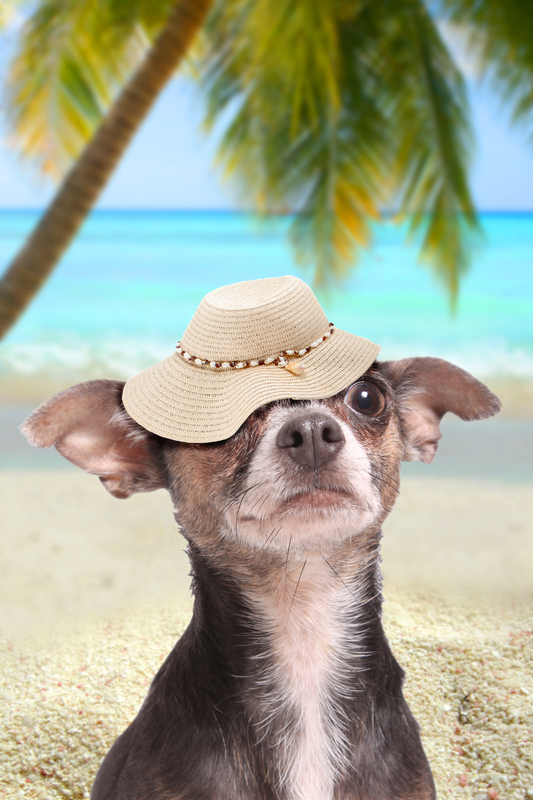 Island Heat + Humidity: Hot weather spells danger for dogs and unfortunately, heat-related problems, are among the most common problems. Dogs do not have sweat glands so they “sweat” through panting and their paw’s pads. As dogs pant they move a large amount of heat out of the body and evaporate it away over their wet tongues. As humidity rises, water cannot evaporate as well so the heat will not evaporate effectively making dogs more susceptible to heat related issues. Humidity can be stressful on dogs and must be factored into the heat index as both raise canine body temperatures to dangerous levels. Dogs’ temperatures are normally 100-102. Veterinarians explain that, if they are exposed to heat, their temperatures can easily rise to 105 and they begin panting or act like they cannot catch their breath.You may notice their tongue hanging to the side of their mouths while panting and extended out as far as it seems able to rather than wanting with their tongue out of the front of their mouths. As their temperatures increase to 106-107, dogs can develop a rapid pulses, begin acting dizzy, collapse or lie down and refuse to walk, develop vomiting or diarrhea, or develop bright red gums. As their temperatures approach 108-110, they can suffer brain, liver, and kidney damage. The best course of action is prevention. Do not take your dogs out to play in the heat of the day. A short early morning or late night walk is best. Schedule long walks for the coolest time of the day but spend a few minutes outdoors during warmer hours, too. 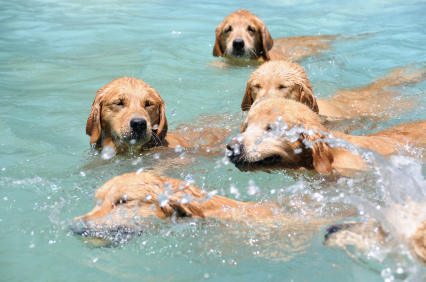 Ideal dog exercise locations are shaded parks and beaches (assuming conditions are safe for swimming) to allow a dog to cool off whenever they like. It can take less than 15 minutes to cause a heat stroke in the right conditions. 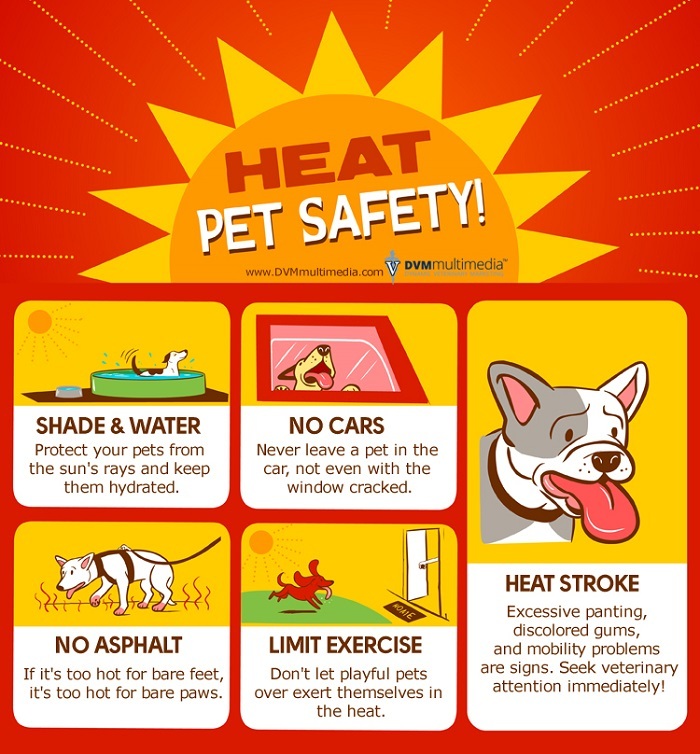 If you notice your dog becoming overheated, discontinue activity immediately and cool them with cool (not cold or ice) water over their backs or bellies and return them to an air conditioned area. Provide extra drinking water while on the island. Your dog’s panting cools but also can dehydrate his body. You may prefer to fill a dog bowl or water container and freeze it overnight. To reduce canine island heat stress, acclimate your dogs to the heat by exposing them to short walks or a few minutes of play while the temperatures are increasing. Use extra caution with brachycephalic or snub-nosed breeds, elderly or very young dogs, dogs with health conditions that compromise their ability to pant effectively, or heart disease. Some island environments can prove especially deadly for certain breeds due to the impact of the continuous heat and impact on their bodies. Any pet should be carefully monitored throughout the day in such climates. Keep outdoor dogs indoors during the heat of the day and during summer months. Do not take them on car rides as the heat in a car easily rise in a short amount of time to 130 degrees, even with windows open.